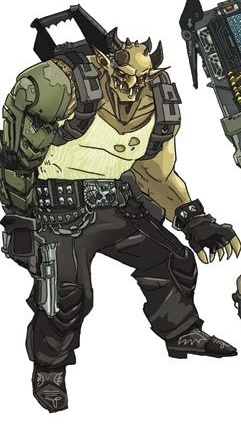 An 8 ft tall troll with dark red/tan skin and curled horns, Barry would cut an imposing figure even without his gang jacket and grenade launcher equipped assault rifle. Drinks heavily, mostly to forget is childhood-he was cast out of his family at puberty, when he goblinized, and scavenged the barren areas of CalFree State before joining up with a metahuman go-gang and terrorizing the small settlements of the area. He took the name of the first man he killed: Barry Goldstein. With the law closing in on his gang, he took off for Mars, where he figured he could find some bodyguard work. He was taken in by Mad Martians boss Yoleus, and remains immensely loyal and grateful. Age 24. 1 1/2 years on Mars. Became an MM leader after Y’s death & the merge with the Problem Children. Got infected with CFD at some point, and was responsible for the deaths of many others in the gangs. On the loose on the surface of Mars.